A fragment of a Late Bronze Age copper-alloy gouge (1150 - 800 BC). The gouge consists of the rectangular shaped blade tip. It is possible that this gouge was socket, however there is no indication of a socket remaining. The blade is C-shaped in cross-section throughout its length and concave, with the hollow of the blade increasing towards the cutting-edge. The sides of the blade are parallel and the cutting-edge is rounded and there is a visible casting-seam present on one side of the object. The break is semi-circular in cross-section and the reverse of the gouge is rounded. The gouge measures 38.3 mm in length, 13.9 mm wide, 10.3 mm thick and weighs 20.95 g.
There are a number of similar objects recorded on the database including LIN-F1C06A and a socketed example IOW-EC25A7. If this gouge was socketed, it is likely that this tool is from the Wilberton, Ewart Park or Llyn Fawr metalworking phases which correspond to Needham's (1996) Period's 6 - 8. 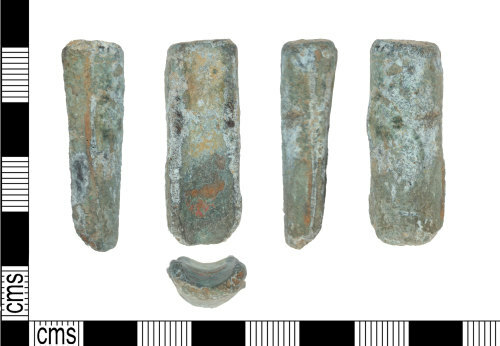 Socketed gouges have been found associated with metalwork assemblages of Wilberton (eg. Guilsfield, Savory, 1980, No. 268. 64-65) through Ewart Park (eg Penwyllt, Savory 1980, No 284. 7-8) and Llyn Fawr (Savory 1980, No 291 9-11).